The festive period is a time to eat festive! But that doesn’t mean you have to eat gluten and sugar if those things don’t agree with your skin, mind and body. Here are my favourite sugarfree Christmas treats! Soak the cashews in warm water just to soften them a tad. Place all base ingredients (except the cacao nibs if you are adding them) in a food processor and pulse until well combined and smooth. Option; Add the cacao nibs and pulse lightly for an extra 15-30 seconds. The added crunch is divine. Spread base into a lined tin and place in freezer. Drain cashews. Place all the coconut mint cream ingredients in the food processor and process until combined and creamy. This may take up to 3-4 mins. Spread evenly over the base and place back in the freezer. In a clean bowl combine the melted coconut oil, cacao, syrup (and optional peppermint) for the chocolate topping. Stir until combined and all the cacao lumps are gone. Pour oven the mint cream and place back in freezer for up to 6-8 hours to completely set. The perfect SUGAR-FREE Christmas slice with spinach. Everyone will love you for the extra vegetable kick. Place dates, sultanas and goji berries in food processor. Blend until smooth. Add almonds, cashews, cacao, peppermint essence, desiccated coconut and spirulina greens powder and whizz until further combined. If mixture is dry – add a splash of water. Otherwise persist with the blending. Once combined remove blade and roll into large golf ball sized balls. 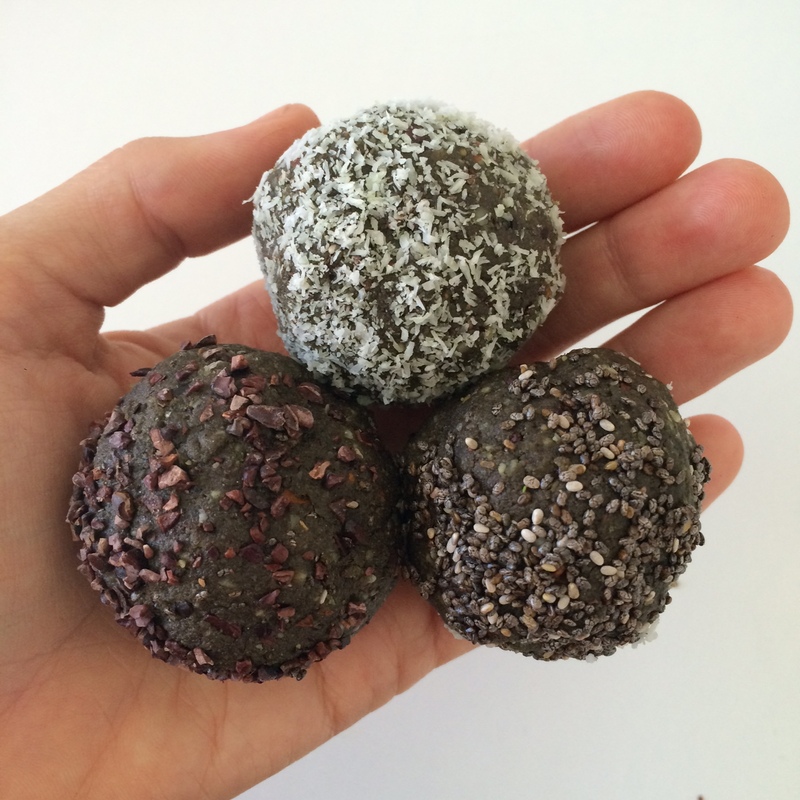 Roll in coconut, chia seeds or cacao nibs for extra crunch and store in the fridge or freezer. Soak the pitted dates in boiling water for an hour. (optional but preferred) Drain the dates and place them in the food processor. Add the sultanas, honey/syrup, coconut oil and blend until you have a smooth caramel consistency. Add the rest of the ingredients until well combined. Place in fridge for an 30mins – an hour. When you are ready to roll, have a small bowl of water or the tap handy to keep your handy moist. Toss the rum balls in finely desiccated coconut. Will keep in fridge for up to 3 weeks – if they last that long!!! In a food processor combine butter, maple syrup, egg and mylk. When combined add the flour, almond meal, coconut, baking powder and spices. Pulse until a dough is formed. Careful not to over process. Wrap dough in cling wrap and place in fridge for 20-30 mins. Preheat oven to 180 degrees Celsius. Sprinkle some flour over the bench and start rolling with a rolling pin or empty bottle. You want to roll it to just under 1cm thick. Use festive cookie cutters to make gingerbread men, xmas trees or stars etc. Place in oven on a lined baking tray for 10-12 minutes. The smaller ones will cook faster so keep an eye out after 8 minutes. Remove if they get too brown. Place on wire rack to cool. Biscuits will get crunchy as they cool. Place in fridge to keep freshness for up to a week. Perfect holiday season gifts! !